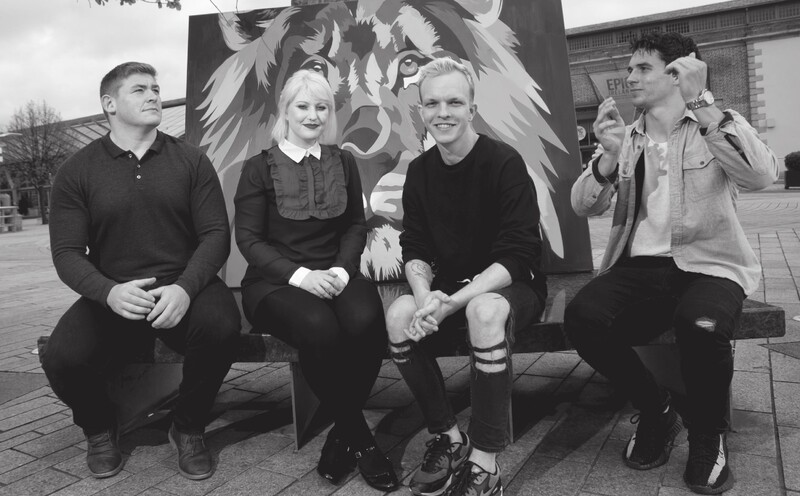 It’s the first year that IAPI’s Young Lions Ireland has run a new-fangled category solely for design, so naturally, we thought; “we’ll give that a go!”. After much (read: little) persuasion from the team, we young-gun, under 30s of the RichardsDee clan were on our way to the briefing session where we were introduced to our client and a unique challenge, a full-scale rebrand of not-for-profit representative body, The Wheel. What was presented to us was the issue of an incredibly important and much-needed organisation that was struggling to express its authority, values, wealth of expertise and experience in the space through its dated and fragmented identity, that had been in use since the late 1990s. The Wheel supports over 1,300 of Ireland’s not-for-profit and voluntary groups through representation, training and advocacy. They play a vital role in ensuring a thriving Irish charity sector, and they wish to grow in the coming years. Their identity, as it stood, didn’t reflect the organisation, or its goals, as it had done when first created. 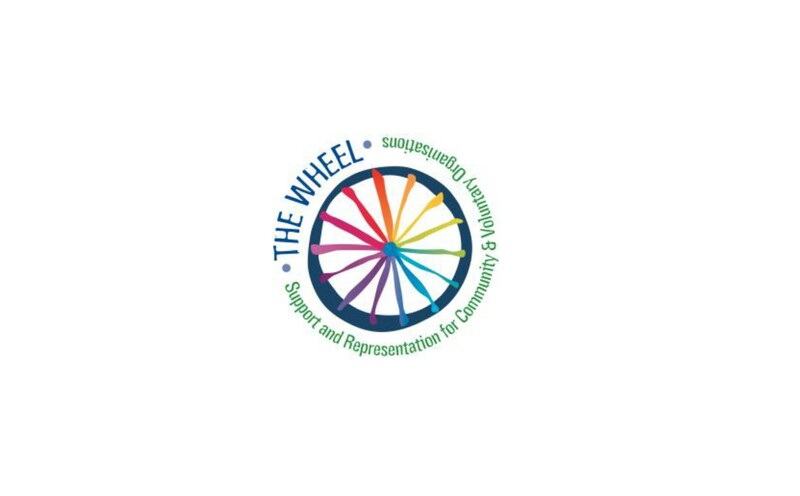 The Wheel had changed and its identity was becoming a hindrance to pushing forward and continuing to strive for positive social change in Ireland. 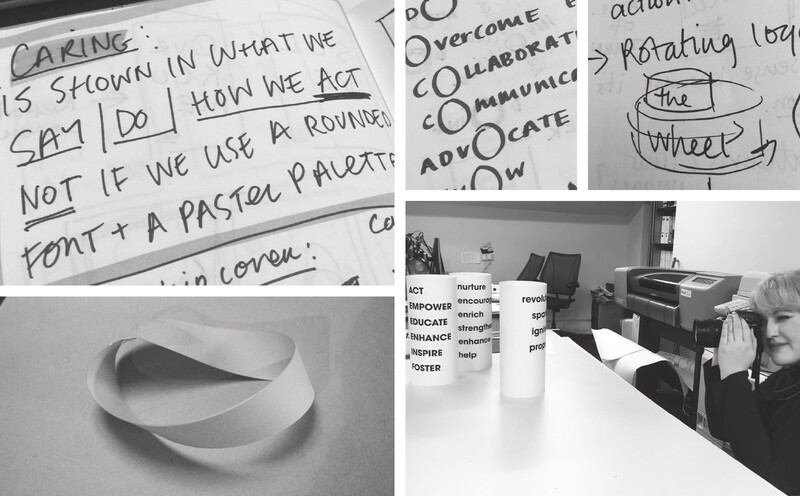 What a fantastic opportunity for us to create a brand identity system that truly reflects the work that The Wheel does, and the values they stand for. An identity that works to transform how their audience perceives their organisation, and one that can challenge perceptions of the not-for-profit sector as a whole. With merely a fortnight until our deadline, we set out to work! We started our adventure with a trip down the rabbit hole. We got intimate with our knowledge of The Wheel, and really got to the core of what makes the organisation tick, what drives it at the heart. We concluded that it is people who drive The Wheel. 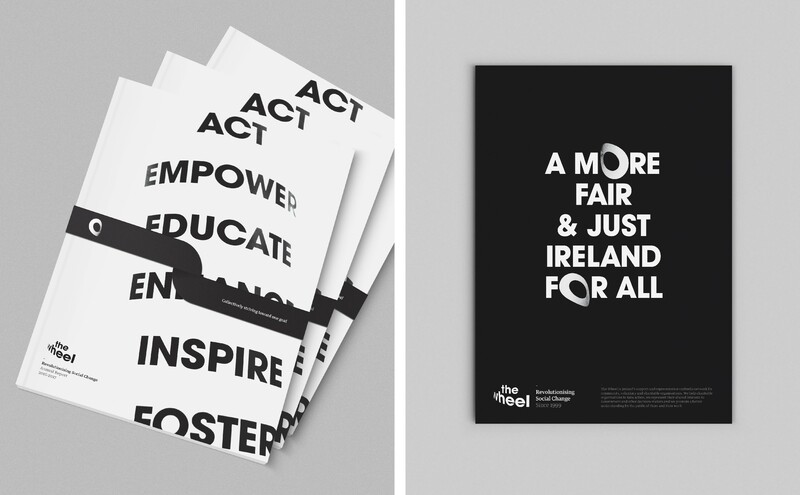 People, striving towards a more fair and just Ireland, through action. We conducted a deep dig into the sector, an exploration of our competitors, and identified key benchmarks in and out of category. We thought, why can’t we be more of a progressive thought leader, like MIT Media Lab? Or how could we represent activity and transformation, like Channel 4? Why can’t we benchmark The Wheel against some of the world’s most dynamic and progressive brands, and champion the idea that organisations like The Wheel are central to achieving real change in Irish society through the empowerment of people, collaboration, and action. Based on our research, we began to develop possible territories for exploration. After a brainstorming session and some scribbling in our notebooks we were equipped with multiple concepts that we could tease out and subsequently decide as to which we felt was strong enough to take forward to creative stage. Ever-moving the wheel turns, leading the way. A supportive structure that not only moves forward but also supports a larger structure than itself. It’s through this free movement that The Wheel is able to shape change, transforming the industry and supporting its members. The Wheel as a collective of doers, working together towards a common goal of a more fair and just Ireland. We are stronger together because, to create positive change, we must use all the resources at our disposal, and our people are the strongest resource we have. We utilise their knowledge, passion, and drive for good by lifting each other up and strengthening each organisation through collaboration and community. We can’t imagine a world before the invention of the wheel. The wheel impacted civilisation powerfully and set the world in motion, sparking the development of society as we know it. The Wheel is a catalyst for progression, evolution, and transformation. The Wheel inspires change, it evolves and enriches the organisations it represents and supports. The revolution is active, constantly moving forward, it’s a cycle, a knock-on effect, a chain reaction, an idea sparked and transformed. It is active and it doesn’t stop. 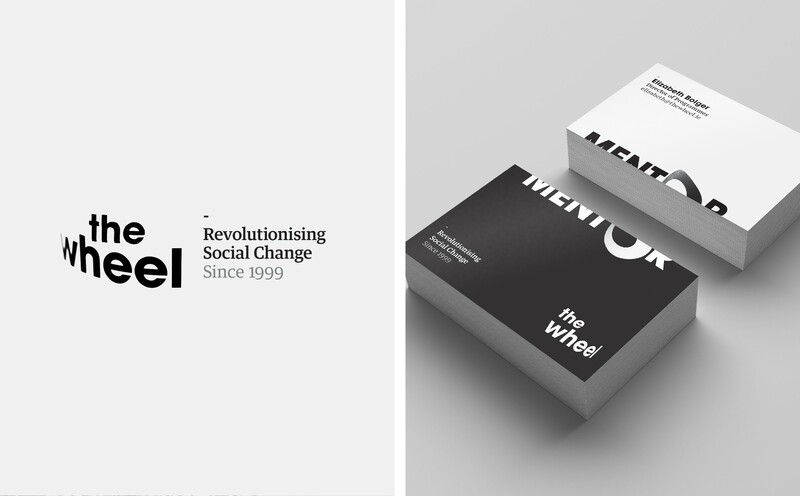 The Wheel tirelessly empowers the organisations it represents, inspiring and enabling an industry to create powerful change and challenge the status quo. The Wheel is always progressing towards its goal of a fairer and more just Ireland, enabling others to do the same. Once we had our concepts clearly outlined, we progressed to creative exploration. 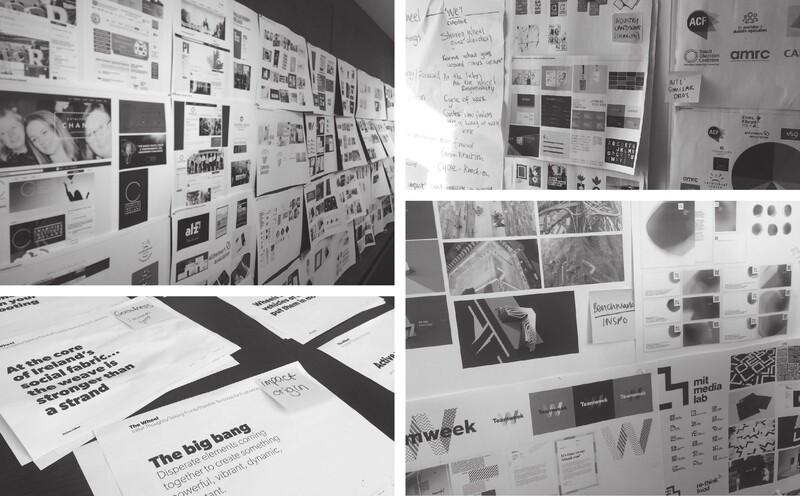 With these core concepts at hand, we started to build outwards and develop our suite of key visual assets in alignment with these ideas, always referring back to the brief and sense checking to ensure that we were on the right path to creating something powerful, and useful, for The Wheel. After various potential executions and visual expressions of concepts we settled on a route that had ‘Revolution’ at its core, though it encompassed the ‘People Power’, ‘Impact/Origins’ and ‘Revolution’ routes, all in one. Every element of the identity needed to suggest these core themes at its heart. Dynamism was key. This identity could not appear to be static, and it had to speak with authority and conviction. We wanted to evoke the duality of the term ‘Revolution’; the physical act of revolving, being active; and a societal revolution that is sparked by the actions of people empowered to create change. The final execution we settled on used dynamic typography that would appear to rotate around a curve, interchangeable wheels that would suggest different factions of the organisation (whether it be common goals or people power etc. ), and cyclical language devices to express the revolutionary action that The Wheel wished to inspire in Ireland through working with and supporting its clients. We employed an impactful black and white colour palette to suggest The Wheel’s transparency and straight-talking attitude. As an organisation in a landscape of groups that have been marred by scandal in recent years, it is imperative that they communicate their position in a clear, matter-of-fact way. You can view the project in full here. We were beyond thrilled to hear that we had been shortlisted in the top 3 in our category by the Young Lions judging panel, and then even more overjoyed to hear that we had actually won! To be recognised by the Young Lions team and to be competing on behalf of our country in Cannes in June at such an internationally renowned and prestigious event is a huge honour. We look forward to keeping you all posted on the rollercoaster that will be the following few months as we get into training for a whirlwind 24 hour brief against 40 other international teams, and prepare ourselves for a fantastic experience attending one of the most renowned festivals of creativity worldwide.